Greetings from McKinney, Texas, and welcome to our first VisitMcKinneyTexas blog! We’re a fast-growing community situated 30 miles north of Dallas. We pride ourselves on our unique qualities: a well-preserved and quite large historic district (over 1400 buildings, both commercial and residential), our parks and open spaces, our “green” initiatives, and our Texas hospitality. 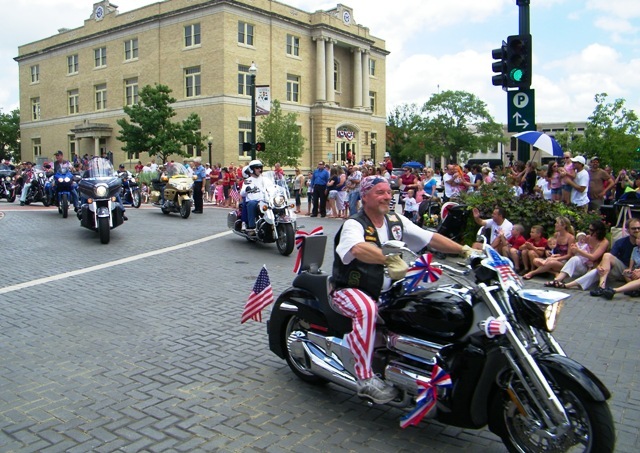 A scene from McKinney's Hometown July 4th parade around the historic downtown square. From the quaint historic downtown square (complete with courthouse in the center, circa 1875) on our east side to the healthy living and athletic-oriented Craig Ranch area on the west side, McKinney truly offers something for everyone. A growing & thriving arts community including our art galleries, stage productions and live music. An eclectic shopping & dining center. The wedding capital of north Texas. A health-conscious community encouraging personal fitness, athletic competition, and healthy living. We’re also open to suggestions, so if there is a topic you’d like to see covered in our blog that relates to McKinney, to Texas, or any related topic a visitor to our area would find interesting, please submit it to us and we’ll see what we can do to get the topic covered in the near future. For more information about McKinney, go to VisitMcKinney.com. You can also download a free Smartphone app for iPhone, iPad or Droid by clicking this link: http://tinyurl.com/VisitMcKinneyApp. Looking forward to your posts! I’ve been hoping someone would do a post on Storybook Ranch. I still haven’t seen it. There is so much in McKinney and you’re in a great position to cover the whole she-bang! I am excited to keep informed of all the hometown events in Mckinney. Thank you so much for taking the time to read our blog entry and for the linkin!